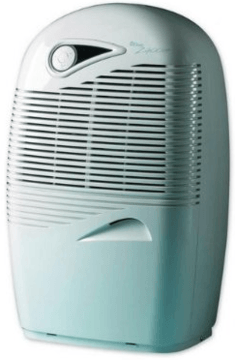 Ebac 2650e Review - This Old Dehumidifier Still A Good Buy? A few years ago the Ebac 2650e was the second most popular dehumidifier on the market. Since then the competition has become stronger, however the 2650e has remained a popular unit, liked for it’s dependability and refinement. We thought it was time that we updated our Ebac 2650e review to see whether this British-made refrigerant dehumidifier can hold its own against strong competition, such as the EcoAir DC202. The control panel on the 2650e is a small LCD display with integrated buttons on the front left of the machine. We feel that it’s awkward to use and difficult to operate without the assistance of the instruction manual to tell you what to do. You can ask the machine to lower or increase the humidity at any time through pressing the plus or the minus buttons and you can gauge what extraction level you’ve set the machine to because a line of water droplets illuminate as you decrease or increase the humidity. However, there’s now way of telling what specific humidity you’ve actually set, other than by getting a separate hygrometer (available very cheaply). Ebac make a lot of their ‘Smart Control’ technology, which apparently “learns about your lifestyle, your home and even the weather outside”. However details on this are extremely limited and even the manual doesn’t tell you anything further about how this works. 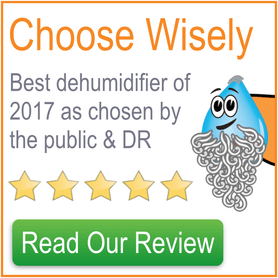 Our assumption is that it works in the same way as other dehumidifiers, by dehumidifying until your targeted humidity is reached (set through the control panel) and then switching into fan-only mode until the humidity rises again. The way that this is set is also unusual. 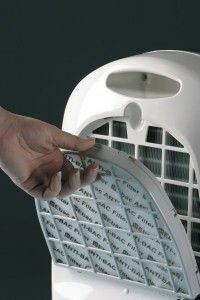 Ebac say that you should switch the unit on and leave it on maximum dehumidifying power for 2-4 weeks until the signs of excess moisture are gone. 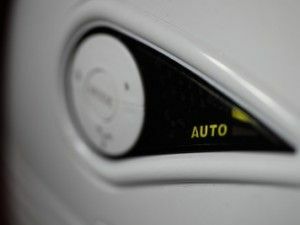 Then you should slowly reduce the dehumidifying power (displayed by water droplets on the control panel) until the unit shuts itself off, which shows that the humidity setting is the same as the humidity of the room. You can then just leave and forget about your dehumidifier while it maintains those conditions. If you keep decreasing the dehumidifying power enough you’ll switch off dehumidifying completely and enable “air cleaning” mode, which just runs the fans of the machine, pushing air through the antibacterial filter. The antibacterial filter kills bacteria and other baddies upon contact so is a welcome feature and should also remove smells. What many people don’t like is that because the filter is made with carbon, it has to be replaced every three months for it to continue to work at a cost of £20 for three filters. 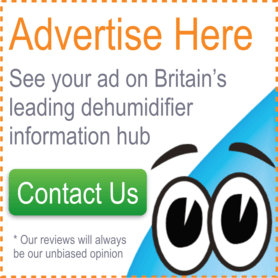 There is only one other dehumidifier on the market that uses a carbon filter, but that also has other antibacterial filters inbuilt that will continue to work once the carbon filter is used up. Most dehumidifiers now use a silver filter, rather than a carbon filter, which doesn’t need to be replaced. Continuing on the air purification theme, as with most other refrigerant dehumidifiers, there isn’t an ioniser fitted to the 2650e. The 2650e comes with two fan speeds, which are independently selectable giving you the choice between quietness and power. A nice feature of this model is the ‘boost’ ability, which you can set for either 1, 2, 4 or 8 hours. During ‘boost’ mode, the fan speed will switch to its highest setting and dehumidifying extraction power is also set to its maximum and will not stop dehumidifying no matter what humidity is reached. This is a great feature to use to dry laundry faster or after high humidity events, such as long hot showers or cooking and because the timer function is built in, you don’t need to worry about turning it back down to normal later. Also on the control panel it the ‘tank full’ indicator, telling you that you need to empty the water collection bucket. The machine will stop dehumidifying when this happens to eliminate the risk of overflows. Another feature we really like is the Jerrycan-style water container, which makes carrying it around a breeze. The 3.5L capacity also greatly reduces the number of trips to the sink you’ll be needing to make. Chances are that if you’re looking at this machine, portability isn’t very high on your wishlist. That will be what Ebac are hoping because the 2650e is tricky to carry around. It’s heavy at 13kg, not the heaviest dehumidifier, but it’s not far from. It’s also fairly large, with dimensions of 25cm deep by 34cm wide by 53cm high. There are fittings for castors, which would be ideal, however you have to purchase these separately, which seems absolutely crazy. Finally the handle is appalling. It’s a single hole in the back of the unit at the top, which is very difficult to lift the unit from. Aesthetically speaking, we don’t really like the look of the 2650e, but it’s a personal thing as I know some people who do like it. For me, the expanses of ‘appliance-white’ plastic and the huge, cheap-looking exhaust grille on the front don’t look appealing. From a practicality point of view, we’ve already said that the water collection container is a great feature, but the control panel is awkward to use and too small. The handle is also a unsuitable for a machine this large and heavy. Being made in Britain, out of hope rather than expectation we were looking for this unit to be refined and quiet in operation, and thankfully this is the case. The fan speed is independently selectable, which means if you need it to be quiet for a certain period of time, you can just turn the fan speed down on to the ‘quiet’ setting. Ebac say that the machine will produce 44dB of sound, which on paper is slightly higher than the competition, however during full dehumidifying operation it’s comparable with the best competing refrigerant dehumidifiers. At its loudest it sounds like an old desktop computer whirring away, with the fans, rather than the compressor, being the most audible aspect. The first point here is, don’t expect the 2650e to produce 18 litres of water per day as is seen in the advertising. This was measured at a sweltering 32°C and 90% relative humidity, which are even more favourable conditions than other refrigerant dehumidifier manufacturers measure their machines at. Most other manufacturers measure their refrigerant dehumidifiers at 30°C and 80%RH, which makes the ’18L’ more comparable to a ’16L’ or even a ’12L’ machine and is why there really should be a standard set of conditions that manufacturers rate their machines under. You should expect a full bucket of water once every couple of days once the machine has settled down. With the above in mind, Ebac rate the 2650e as suitable for up to a 4 bedroom house and this seems about right. In conclusion, the Ebac 2650e review is a bit of a mixed bag, some good bits, some not so good bits. While we found the 2650e with a surprisingly large discount at this shop, you may want to consider the slightly more expensive, but better, EcoAir DC202. Hey there, I am wondering if I may use this post in one of my websites if I link back to you? Thanks! Sure, no worries Myrtice, thanks for visiting. Great review. Thanks for posting such an in depth impression. I’ve had a look at one in the store, but your review covered a lot of ground that I wasn’t able to with such a limited amount of time. My ebac machine been running non stop quietly for the last 20 years without any problem. Now I am buying the 2650e for my son’s flat. I should last at least for 20 years !